PRESCOTT - Put rapper Dr. Dre and country singer Johnny Cash into a blender, mix at high speed, and pour out the Paul Chesne Band. "We can't be tamed," Chesne said from his home in Los Angeles. 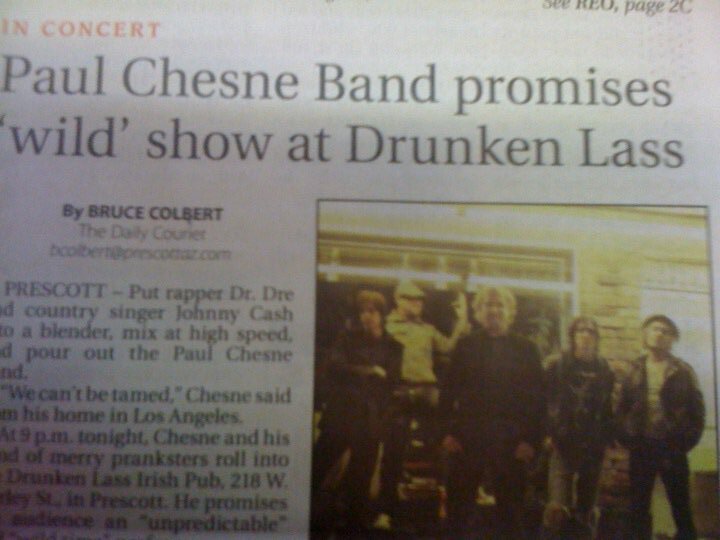 At 9 p.m. tonight, Chesne and his band of merry pranksters roll into the Drunken Lass Irish Pub, 218 W. Gurley St., in Prescott. He promises the audience an "unpredictable" and "wild time" performance. Chesne, 34, started playing guitar at the age of 12, and he's never looked back. "I grew up steeped in Paul Simon, the Beatles and Bob Dylan," he said. "I heard Johnny Cash and Willie Nelson when I was 18, and it opened my eyes to country music." His music interests branched into hip-hop, gangster rap, hard rock and metal. But, he said, he is "always drawn back to bluegrass, early rock-n-roll" and Americana-type music. The band consists of Chesne on guitar and vocals, his "light-fingered wingman" Eric "Dutch" Suoninen on guitar, Stephen Tegel on bass, Paxton Pryor on drums, and keyboardist Jon Niemann (who was unable to make it to Prescott). Chesne and a friend formed the L.A.-based band in 1999. The current members have been together for four years. "I went through a lot of itinerant musicians over the years before we all came together," he said. "We work together really well on stage. We communicate by mental telepathy." The Chesne band is not a typical garage band making a name for itself. All the members have formal training, and Chesne majored in English at college. Although the band plays some cover songs, most of its song list consists of Chesne's originals. However, in keeping with his philosophy of unpredictability, an audience could be treated to songs ranging from Michael Jackson to the Rolling Stones to just about anything in between. The band has a reputation for madcap, unpredictable and explosive antics and lyrics when it takes the stage. Chesne works a stage like it's a trampoline - he's up, down and all around, and sometimes ends up flat on his back riffing his guitar. "We don't play too many weddings," he said. "We do a lot of songs with sexual innuendo, with drug and drinking references, and that's not the typical wedding band. "We've been doing it our own way for so long, it's hard not to. If the money's right, we might sell out. But until then, we'll remain the way we are." When the band goes on the road, a sixth member of the band delivers them to their destination - a 2000 Dodge van, affectionately named "The Van." "The van is like a character with its own personality. It's like a member of the band," Chesne said. "It looks like a classic 'murder van.' It's been through the ringer." While the band has its own website, www.paulchesne.com, The Van has its own Facebook page. Read about The Van by going to facebook.com and typing in "The Van." Prescottonian April Payne saw the Paul Chesne Band at a wedding (Chesne's previous statement notwithstanding) in Los Angeles, and she and her husband, Jake, became friends with Chesne. Jake performs tonight with the band. "It was a rock-n-roll wedding, and she said we had to come to Prescott to play," he said. Chesne wrote a "manifesto" about why the band plays music: "For the love of it. Because we're hungry. To make people happy and dance. To make all the pretty girls cry. Because we're high. Because we're low. Because we're drunk or ascetic. Because we can't in good conscience do anything else." From Chesne's Los Angeles work office, he can see the famous Hollywood sign in front of him, and "a couple of hundred thousand people" swarming around below him. "I've heard it's beautiful out there," Chesne said gazing out his window. "We're looking forward to getting out of the city and into some solitude. "We want to make a footprint out there. Do a good job, get the word out and hopefully get invited back." 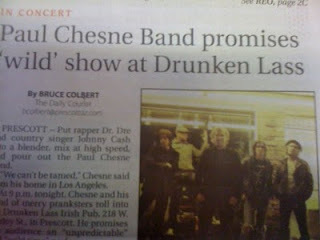 After tonight's Drunken Lass gig, the band plays Saturday at the Oak Creek Brewing Co. in Sedona.